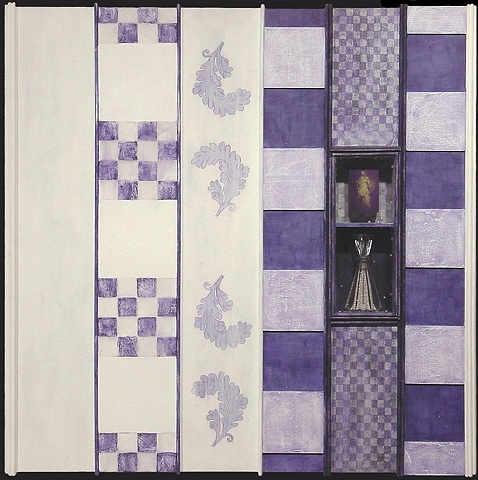 Having been an artist for over thirty years, this recent work has qualities and elements that speak to that experience. Educated as a sculptor, I am naturally attracted to three-dimensional form. I have collected, produced and restored objects over that time period. I have traveled to Latin America to buy and collect ethnographic objects. I cannot always explain what it is that draws me to an object, it speaks to me aesthetically and I respond. I am especially partial to objects with a history, a patina of time and use. In this series, I part with some objects that I have had for almost forty years. It is bittersweet parting with them, but I believe I have created suitable environments for each object to continue on in a new and more exalted context. Each piece is unique because I begin with an object and build the piece around it. I develop each reliquary as though someone else is making it for him or herself or a valued person. All objects are genuine and authentic, not reproductions. All objects are as found they have been not altered except to permit display. I am happy to do commissions. If you have an object, not too large, that you would like to have me make into a reliquary for please, contact me. 24 1/4" x 24 1/4" x 2 3/8" d.